If you wanted to discover a new giant exoplanet, where would you look? New research shows that star clusters are a good place to start, at least if you want to look for giant exoplanets close to their host star. Hot Jupiters are a breed of exoplanets that have masses about the mass of or larger than Jupiter and orbit a star in 10 days or less (for comparison, Mercury takes 88 days to go around the Sun). When they were first discovered, they posed a problem to planet formation models as it was thought gas giants could only form far from their host star where it was cool enough for ice to form, which allows for larger planets to be made. Since then, studies have shown these planets could form far out and migrate inwards over their lifetime. This can happen through interactions with the disk in which the planet forms (known as Type II migration), or through gravitational scattering with other planets or nearby stars. Brucalassi and her team decided to investigate an open cluster in the Milky Way (Messier 67) to look for hot Jupiters. Over several years they used three different telescopes (the ESO 3.6m telescope, the Hobby Eberly Telescope and the TNG on La Palma of the Canary Islands) to take high-precision spectra of 88 stars, 12 of which are binary stars. This spectra could then be analyzed for small blue- and redshifts which indicate the star is moving slightly. In this case, that movement is caused by the presence of another body, the exoplanet. This method is known as the radial velocity method and is the method that was used in the first exoplanet discoveries. To make sure that each star’s own activity wasn’t affecting its spectra, the group measured the Hα line which shows how active the star’s chromosphere is. Figure 1 shows an example of the radial velocity measurements. Figure 1: Radial velocity measurements for YBP401. The coloured dots represent the different telescopes the measurements were made at. 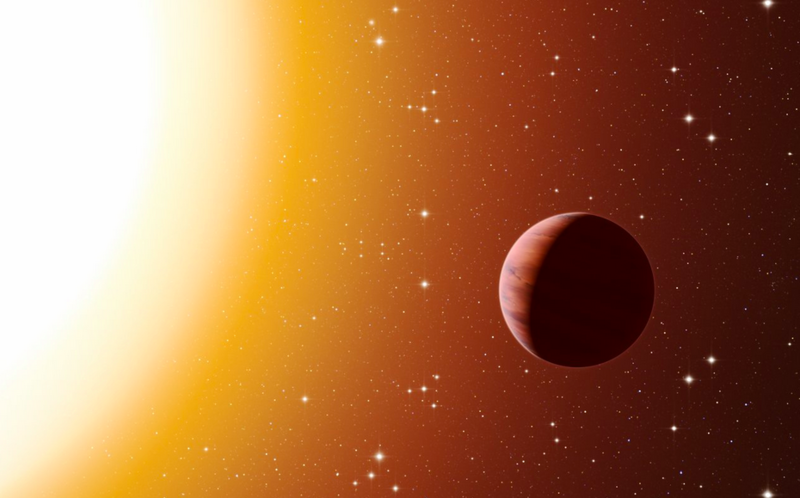 The measurements show an exoplanet with a period of just 4.08 days. The group’s measurements revealed a new exoplanet around the main sequence star YBP401. They were also able to get better measurements on two stars (YBP1194 and YBP1514) with known hot Jupiters. This brought the total number of hot Jupiters to 3 out of 88 stars. Although 3 might not seem like a very big number, it is larger than the number of hot Jupiters found around field stars (stars not in clusters). For the statistical analysis, Brucalassi compares the number of exoplanets with the number of main sequence and subgiant stars, i.e. stars that are not yet at the ends of their lives. Of the 88 stars, 66 are main sequence or subgiant, and of those only 53 are not binary stars. Most radial velocity studies choose to not observe binary stars so it is important to compare numbers with that in mind. 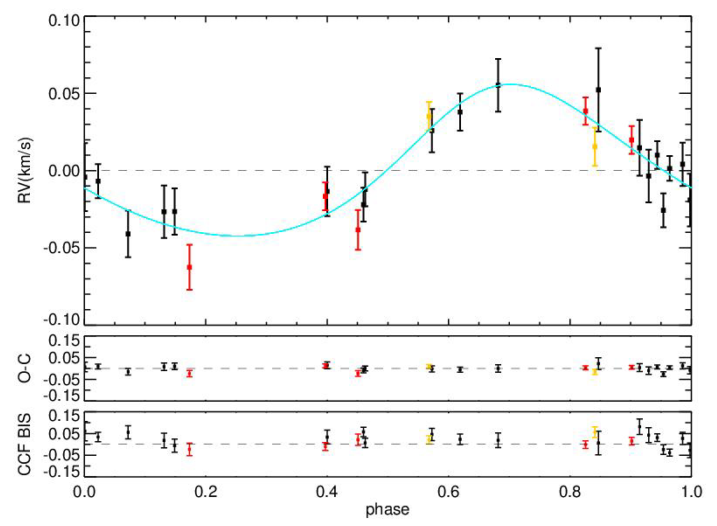 A previous study from 2012 found a hot Jupiter frequency of 1.2% ± 0.38 around field stars. Brucalassi finds 4.5+4.5-2.5% when comparing with only single stars (not including binaries) in M67. To compare with statistics from the Kepler mission, binaries are included, as Kelper also surveys binaries, and the percentage for hot Jupiters in a cluster is 5.6+5.4-2.6%. The Kepler mission finds a frequency of hot Jupiters of just ~0.4%, which is considerably lower. And this trend isn’t seen just in M67. Combining radial velocity surveys for the clusters M67, Hyades, and Praesepe, there are 6 hot Jupiters in 240 surveyed stars, whereas the study from 2012 found only 12 in survey of 836 field stars. It’s known that systems with more metals tend to produce more planets and the star’s mass may also have an effect on planet production. However, the cluster stars and field stars are on average the same mass, so this alone cannot account for the differences. M67 is also at solar metallicity (i.e. it’s stars tend to have the same amount of metals as our Sun) so this can also not account for the excess of hot Jupiters. Brucalassi concludes that the high number of hot Jupiters is due to the environment. Past simulations show that stars in a crowded cluster environment will experience at least one close encounter with another star, which is all that is needed to drive a Jupiter in to a closer orbit. This new research gives further evidence to this theory, putting us one step closer to understanding how exoplanets can form. Figure 2: An artist’s rendition of the new hot Jupiter. Click on the image for a full animated video of the M67 cluster. Courtesy of the ESO press release (#eso1621). Mara is working on her master's at the University of Victoria, Canada. In a nutshell, her research is taking pretty pictures of the universe. She spends half of her time with the Gemini Planet Imager Exoplanet Survey team trying to directly image new exoplanets, and the other half looking for galaxies responsible for damped Lyman alpha systems in the images of quasars. When she's not looking at scientifically pretty pictures, she's capturing earthly beauty with digital photography or trying to stay grounded with rock climbing.